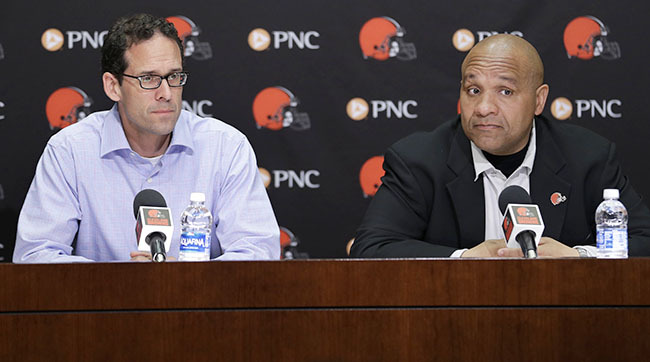 BEREA, Ohio — Late Thursday night, Hue Jackson and Paul DePodesta emerged from the Browns’ draft room together, wearing matching team pins on the left lapel of their suit jackets. They had just drafted their first player in Cleveland, speedy Baylor receiver Corey Coleman, and they looked quite pleased. Not just because Coleman was the top player on their board at a position of need, but because they had also executed their master plan, perhaps even better than expected. Imagine that, the “football guy” and the “Moneyball guy,” on the same page. This is what a curious public has kept a skeptical eye on since January. Paul DePodesta and Hue Jackson. It’s unwise to overreact to any draft right after it ends, because it will take a few years to know whether the players selected were hits or misses. But what Cleveland did on draft weekend is immediately significant for this reason: It revealed the plan of this new Browns regime led by Jackson; DePodesta, the baseball exec turned Browns chief strategy officer; and Sashi Brown, the Harvard-educated general counsel promoted to executive vice president of football operations. And that plan is building through the draft. Sure, a lot of organizations say that. But few have committed to it the way the Browns did this past weekend. They turned their No. 2 overall pick, via two trades down in the first round with Philadelphia and Tennessee, into this haul: the No. 15 pick, two third-rounders, a fourth-rounder, a 2017 first- and second-rounder and a 2018 second-rounder (they also gave up a sixth-round pick and a future fourth). That’s stunning. Those who knew DePodesta in the baseball world predicted that this was exactly how his first draft with the Browns would go. But the plan being followed in Cleveland has to do with more than just his influence. The Browns are following a path paved by both analytics and some of the most successful NFL organizations of our time. The Browns’ strategy isn’t new. 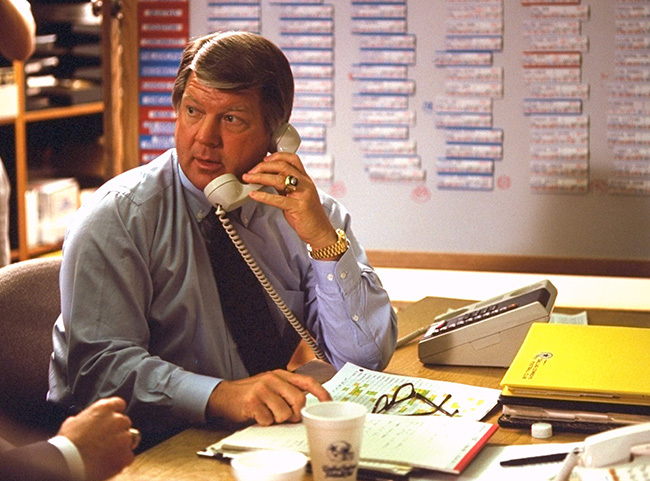 It can be traced back to the tenure of Jimmy Johnson (here, in the Cowboys’ war room in 1991) in Dallas. In 1989, Jimmy Johnson took over a Cowboys team that had gone 3-13 the previous season under Tom Landry. If Landry could only manage three wins, Johnson knew he needed to take drastic measures to overhaul the roster, or else he wouldn’t be around long enough to see a good football team. He didn’t need just one player. He needed a lot of players. And he decided he was going to get as many as he could through the draft. Johnson actually is a fisherman. Back when he was a younger coach, Barry Switzer and Galen Hall would join him at his beach house outside Galveston, Texas, where they would pull a 300-foot seine behind their boat and pick out the speckled trout from the mass of sealife they’d pull up. But he also put the metaphor into practice in football. Trades weren’t as common in the ’90s as they are now, but Johnson boasts that in his five years in Dallas, the team made 51 trades, “more than the entire league put together,” according to Johnson. Over time, Johnson developed his draft value trade chart, which is still in use today, to determine compensation when trading draft picks. The most famous trade during his Cowboys tenure was the Herschel Walker swap with Minnesota, which netted draft picks that helped his team acquire difference-makers like Emmitt Smith, Darren Woodson, Kevin Smith and Russell Maryland. Those players, of course, were part of the Cowboys core that would go on to win three Super Bowls. Loading up on draft picks isn’t a one-size-fits-all philosophy. If you can hit on a franchise quarterback, that may make more of a difference than any number of picks would; or, a team that sees itself as one or two pieces away from being a Super Bowl contender might be best-served going all in for a specific player who can get them over that hump. But the logic is simple: If you pick more often, you have a better chance of yielding some quality contributors. This approach is not just anecdotal. It’s backed by the a-word—analytics—which more teams in the league employ than most people probably realize. Joe Banner, former executive with the Eagles and Browns, hired an employee with a Ph.D. in math about 20 years ago when he was with Philadelphia. In researching draft strategy, they studied 15 years of drafts to compare the hit rate on picks in the top 10 vs. the bottom third of the first round. The Eagles study defined a successful first-round pick as a player who was a full-time starter for at least two of his first four seasons. The results, Banner said, showed a negligible difference between the groups. The success rate of picks in the top 10 was slightly higher than 50 percent, and it was slightly lower than 50 percent for picks in the bottom third of the round, but basically there was a 50-50 chance of a team hitting on a draft pick no matter where in the first round he was taken. Or, take a look back at the 2013 first round. This week was the deadline for teams to pick up the fifth-year contract option for these first-round picks. Leaguewide, 12 of the 29 options were declined, including for five players drafted in the top 10 that year. (Of the other three players, one was cut, one signed a long-term deal and one was suspended last season so his option kicks in a year later). No matter how good their football evaluation is, teams can miss on a pick for any number of reasons, whether it’s injuries or a scheme misfit or a player’s lack of drive. That’s why it behooves you to play the odds. There’s some irony in Banner’s praise of his former team. His tenure as the Browns CEO lasted just over a year, and only one draft. But before he was let go in February 2014, he had helped set the team up with extra first-, third- and fourth-round picks for the 2014 draft. That first-round success rate study done with the Eagles was cited often in team strategy meetings attended by two of Banner’s hires: Sashi Brown and Ken Kovash, a director of football research who was promoted to vice president of player personnel this offseason. This past weekend, Brown and Kovash were among the seven team employees inside Cleveland’s draft room. • THE FALL OF JOHNNY FOOTBALL: The MMQB combed through Johnny Manziel’s past and spoke to more than a dozen people who are or were in the quarterback’s inner circle to find out: Just how did it go so wrong? Has Johnny Football played his last NFL game? And if so, does he even care? By the end of Friday night, five of the Browns' 14-man draft class was already in place (from left to right): USC QB Cody Kessler, Auburn OL Shon Coleman, Penn State DE Carl Nassib, Oklahoma State DE Emmanuel Ogbah and Baylor WR Corey Coleman. By now, we know that Jackson strongly dislikes the word “rebuilding.” Since he was hired in January, the coach has offered plenty of alternatives. Retooling. Reboosting. Earlier this offseason, eyebrows were raised when the team let another class of free agents walk out the door, including receiver Travis Benjamin, safety Tashaun Gipson, center Alex Mack and tackle Mitchell Schwartz. The Browns were a Joe Thomas trade away from a total rebuild. All the while, Jackson kept pointing to a “plan” and a “process.” The 14-player draft class—tied for the biggest in the NFL since the draft went to seven rounds in 1994—was a window into exactly what that is. The strategy was to get players they wanted, at the correct value. Jimmy Johnson hasn’t met with any members of the Browns’ current regime, but their approach mirrored the one he used to rebuild the Cowboys. Cleveland had its eye on drafting Coleman but didn’t need to use the No. 8 pick to get him. So the Browns traded back, picked up extra draft capital and still got a guy they wanted. How they handled the quarterback position was similarly value-driven. After the Rams traded up into the No. 1 spot to draft Jared Goff, the Browns were not going to use their No. 2 pick on a quarterback, so they auctioned it off to a team that would. They liked Paxton Lynch, but not in the top half of the first round. They finally selected a quarterback, USC’s Cody Kessler, when they felt the value matched up with a player they liked—but only after trading down 16 spots in the third round. When the Browns picked Kessler, to some surprise, Jackson told the media, “You’ve gotta trust me on this one.” The quarterback was clearly Jackson’s pick, a reminder that yes, football and analytics can coexist. Later, Jackson listed the reasons why Kessler was the right fit: He can throw accurately, knows how to win and has the ability to uplift players around him. Intangibles and character were weighted highly in this Browns draft. Among their selections were Auburn offensive lineman Shon Coleman, a cancer survivor; and pass rushers Carl Nassib of Penn State and Joe Schobert from Wisconsin, two former walk-ons who became All-Americans. The chaos of recent seasons, notably the Johnny Manziel drama and Josh Gordon’s year-long suspension for violating the league’s substance abuse policy, was a direct factor. As Brown put it, there’s no way they can cut corners right now. Climbing out from under their recent history is a perennial challenge for the Browns. This regime, with three Harvard degrees and all, isn’t claiming to have the answers. Just a plan: 1) Stockpile draft picks. Check. 2) Turn those draft picks into players who can win football games. TBD.